Aignan-Thomas Desfriches, according to an inscription on the verso. Connected with the series of nine etchings depicting hunting scenes, Les Chasses à différents animaux, dated 1654 (DeVesme 732-740). Like most of these studies, this sheet was probably executed in Florence in the early 1650s after della Bella's return from a decade spent in Paris in the service of the Medici ambassador to the court of King Louis XIII. 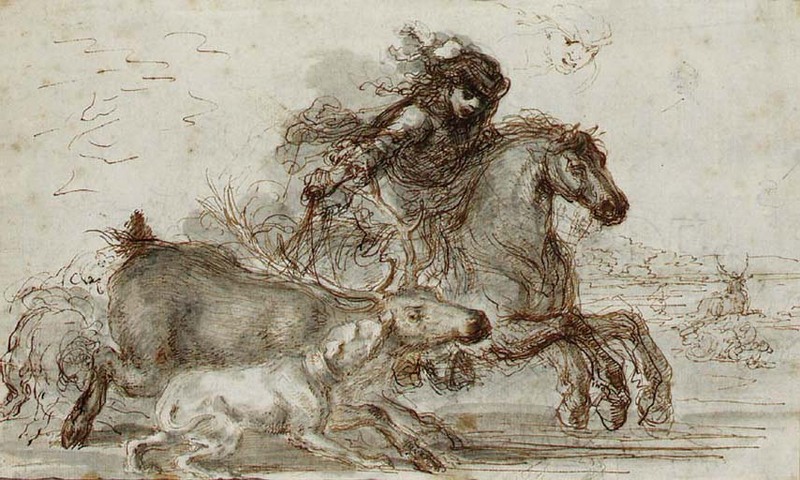 Other preparatory drawings are in the Louvre, F. Viatte, Inventaire Général des Dessins Italiens, Dessins de Stefano della Bella 1610-1664, II, Paris, 1974, pp. 201-4, nos. 333-338; in the Biblioteca Marucelliana, Florence, Vol D., nos. 27 and 101; at Windsor Castle, A. Blunt, The drawings of Castiglione & Stefano della Bella...at Windsor Castle, London, 1954, p. 96, nos. 66-67; in the Albertina, V. Birke and J. Kertész, Die Italienischen Zeichnungen der Albertina, Munich, 1992, I, nos. 955-956, illustrated; and in the Suida-Manning Collection, now in the Jack S. Blanton Museum at the University of Texas at Austin.